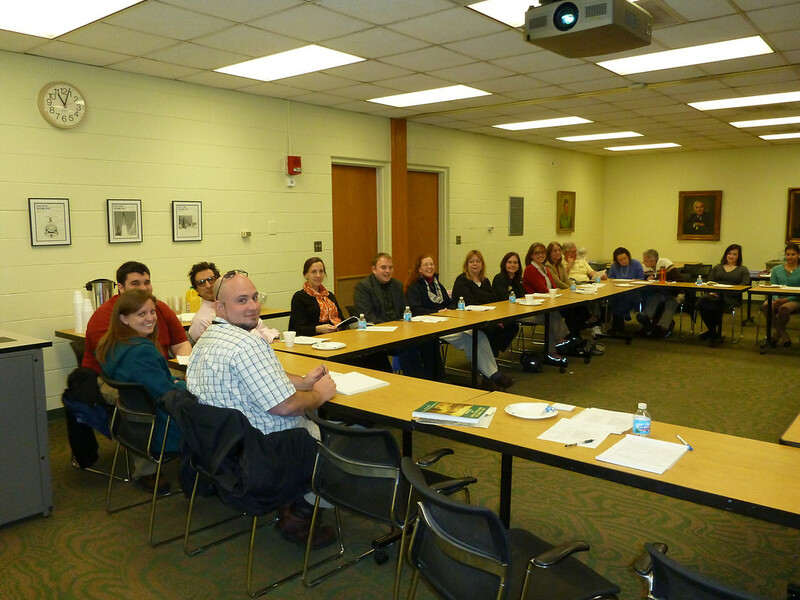 Yesterday was the most recent meeting of the Miami Valley Archives Roundtable (or, MVAR), an informal gathering of archivists in and around Dayton, Ohio. This time, we met at the Heritage Center of the Clark County (Ohio) Historical Society. Our hosts were curatorial assistant Natalie Fritz, curatorial technician Mel Glover, and director of collections Virginia Weygandt. There were 20 people in attendance. As MVAR Chair, I started off the meeting with a couple of announcements—really, follow-ups from our previous meeting (11/15/2012) and the subsequent survey I sent out afterwards asking for input about creating an MVAR web site and collection membership data. The second announcement was actually more of a non-announcement: Basically, that I have not made any further effort to collect data for a membership list, so no, you didn’t miss that email/memo/form/etc. I haven’t had a chance to go any further with that just yet! After the announcements, we did the institutional reports. I, Lisa Rickey, MVAR chairwoman and an archivist at Wright State University Special Collections & Archives, shared several bits of news, most of which seem to pertain to the upcoming 1913 flood centennial–which, honestly, is not that surprising, considering how many flood projects I have swirling (ooh, bad pun) in my head (and on my desk) at the moment. I am currently working with a couple of our public history grad students on two related 1913 flood projects: an archival resource list (it’s going to look different soon but here’s the link anyway for now) and a virtual gallery (using Flickr). We just sent invite letters out to area organizations about these today, so hopefully many repositories in the area will contribute to help make them successful. We have a few submissions already, but we’d love more! 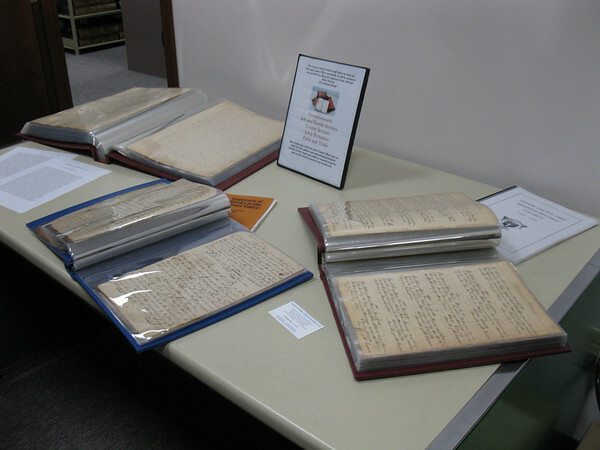 I’m also working on a series of blog posts to be posted during the days of the actual flood centennial- letters and diary entries posted day-by-day from 4 different flood survivors whose manuscripts are now in our collections at WSU– so watch for that on the WSU Archives’ Out of the Box blog the last week in March. We’ve also created a special 1913 flood section of the WSU SC&A web site to aggregate all the various 1913 flood stuff listed in various places on our web site (manuscripts, exhibits, blog posts, etc.). In other WSU-blog-related-but-not-1913-flood-related news: our Dayton Daily News Archive blog more than doubled its previous high (of about 500) on single-day site views on February 9th (with nearly 1,300 views!). That was the weekend of Winter Storm Nemo that pummeled New England, and I noticed the news and weather crews kept referring to “the Blizzard of ’78.” Well, I guess it got lots of people curious, because they were Googling “Blizzard of 1978” — and our DDN Archive blog post on the “Blizzard of 1978” is the first hit on Google for that search term (even above Wikipedia)! Over 1000 of those 1300 views on Feb 9th were for the Blizzard of ’78 entry. In other non-blog news, our University Archivist Chris Wydman was interviewed by the WSU Newsroom for an article about the history of the WSU tunnel system. A day or two after that, Channel 2 (WDTN) brought a film crew in to ask him about it, but so far, we have yet to see that footage anywhere. And finally— good Lord, I am long-winded this time!—in personal news (OK it’s still career stuff but specific to me, not WSU), I will be giving a session on “Promoting your Collections Online” at the Ohio Local History Alliance’s Region 7 Meeting in Wapakoneta on March 16th. And I am also writing an article for the spring issue of the Society of Ohio Archivists’ newsletter Ohio Archivist about the various 1913 Flood commemoration activities. Jennifer Gerth of the Marianist Archives told us about a very interesting reference question she recently answered (aka a family mystery she helped solve!). She also told us there will be an upcoming exhibit for the flood centennial: Hope on the Hill: Marianists and the 1913 Dayton Flood. Gillian Hill, Joan Donovan, and Robin Heise, all at the Greene County Records Center & Archives, told us some fascinating stories from the slave emancipation records they are working with. They have been transcribing them and hope to do a digitization project with them in the future. Cindy Manz, former (retired) records manager at the Miami Conservancy District, told us about a family photo scanning project she has undertaken for a friend. Roger Lucas, a representative with Indoll Dayton (filing, storage, and record conversion solutions), has been working with the WSU circulation desk renovation. He also mentioned that there may be several used high density mobile shelving units coming up available soon for a low price—at which statement many ears perked up! 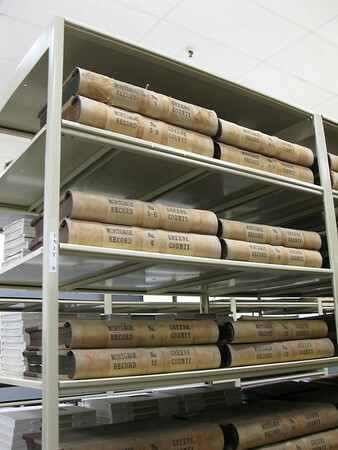 Tina Ratcliff, records manager at the Montgomery County Records Center & Archives, told us that — surprisingly — few of the county records seem to even mention the 1913 Flood. (They’ve looked!) How strange! Virginia Weygandt, Mel Glover, and Natalie Fritz, of the Clark County Historical Society (our hosts for the meeting), had lots of good news to report. They were recently able to repair a leak in the roof, and an office that had received some water damage was in the process of being repaired. (OK, so water problems are never good news—but getting them fixed certainly is!) 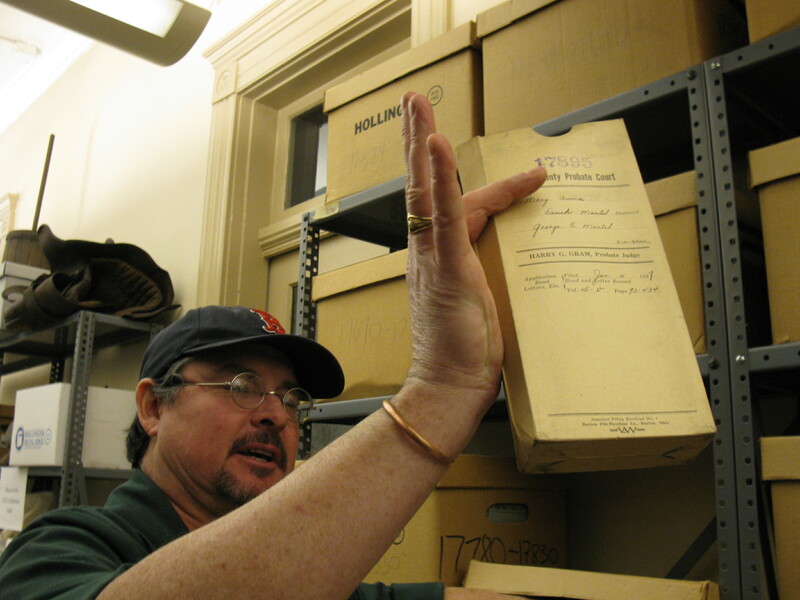 They have just finished up an OHRAB-funded project to re-house probate court records; they’ve filled 200 banker boxes with over 8000 folders in the course of 2 years. They even won an OHRAB Achievement Award for the project in 2012 (see photo below)! 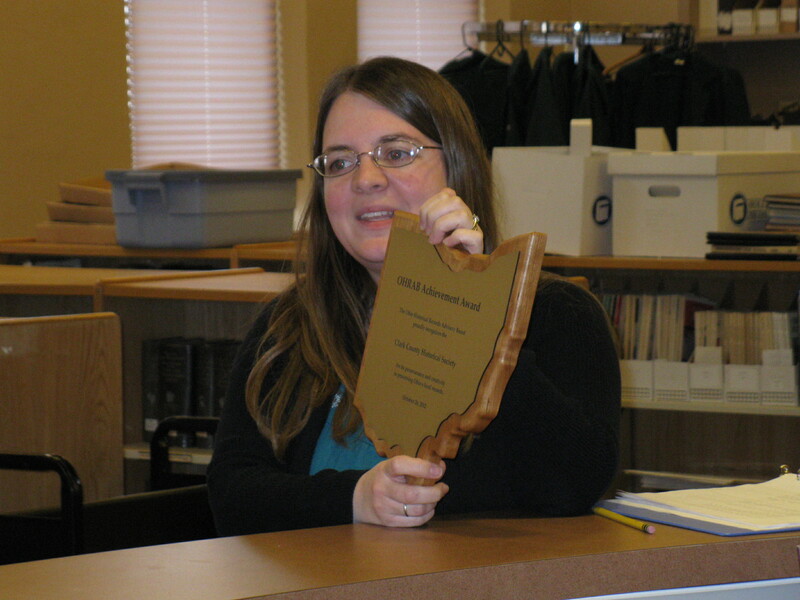 Natalie showing us the OHRAB Achievement Award they recently won for their probate court records project. They also recently received a grant of $3000 from NEH for some new boxes. In exhibits news, they currently have an exhibit up called Newsweek 1983: Revisiting the American Dream, for the 30th anniversary of a 1983 Newsweek magazine article that put a spotlight on Springfield as representative of America in general. A dramatic performance “Spotlight on History” also accompanied the exhibit opening on Feb. 15. They will also be holding their annual “Night at the Museum” event on March 9th. Betsy Wilson, who writes house histories and researches historic properties, told us about a really interesting home she’s currently researching, as well as an architecture research project she has in the works. Galen Wilson, of NARA, is currently working on a team charged with rewriting federal records retention schedules. He also serves on the OHRAB and mentioned that there’s still time to apply for one of the 2013 OHRAB grants. Then he shared a great anecdote about “deaccessioning” some of his personal papers. Bill McIntire is “the new Lisa (me)” as reference librarian/archivist at the Dayton Metro Library, where he started in January, after having been the DDN Archivist at WSU. He said he’s still learning the place. Jen Haney is also getting used to her new job as “the new James [Zimmerlin]” at the Warren County Records Center & Archives, where she recently started as the records manager. (James accepted a position as records manager at CareSource, though he has been around to help Jen with the transition.) Jen said that, among other things, they are working on adding some search capabilities to the web site. Gino Pasi, one of my fellow archivists at Wright State University, talked about the 1913 Flood traveling exhibit we recently started sharing with the public. The exhibit opening on January 24th was a great success. He also told us about an ongoing project with the Five Rivers MetroParks, who have enlisted volunteers to help them gather and organize their records, as well as select materials for their 50th anniversary celebration (this spring), before sending those materials to the WSU Special Collections & Archives. As collections manager, Gino has been working with them on the project. Collette McDonough, archivist at the Kettering Foundation, told us about some really interesting photo processing projects she’s been working on recently. She also said that she is looking for a volunteer to help re-house photos, but there’s a possibility that the position might eventually become paid. After the institutional reports, we went over the list of relevant upcoming conferences, which you can find on the “Relevant Conferences” page of the new MVAR web site! Also: I used to not put the locations on here, but according to the survey from November, people don’t seem to think it’s a problem to go ahead and post the locations publicly online. I guess nobody’s worried about crashers, or mass murderers with an axe to grind against all archivists everywhere and looking to take several out in one shot. (Some imagination, right?) Anyway. Next was the tour. I had been to the Clark County Historical Society’s Heritage Center museum and archives a few times before, but it had been a while. 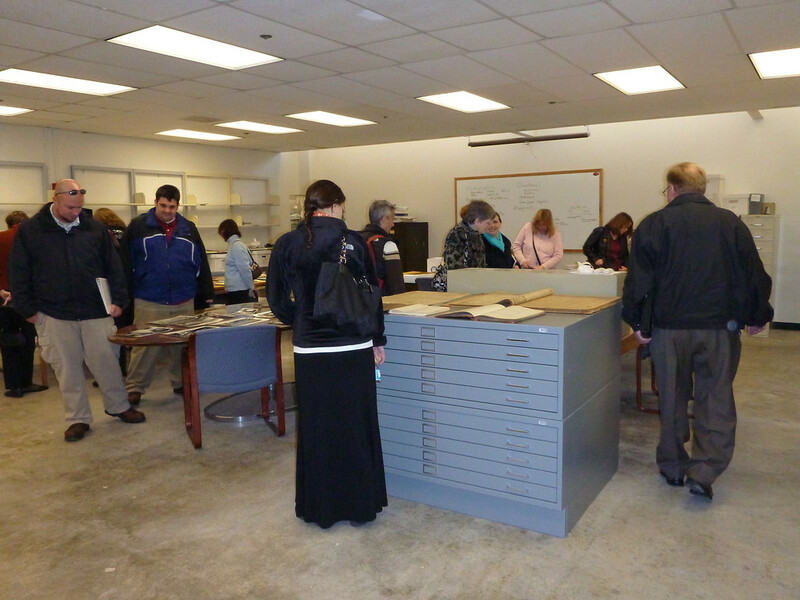 They showed us around some of their storage areas, including showing us examples of the probate court records– some of the re-housed ones, as well as some of the not-yet-re-housed ones (see photos below). We also checked out the archives reading room (see photo above). After the tour, we had lovely box lunches from a local bistro. They were pretty tasty— especially the dessert! And so another great MVAR meeting came to a close! 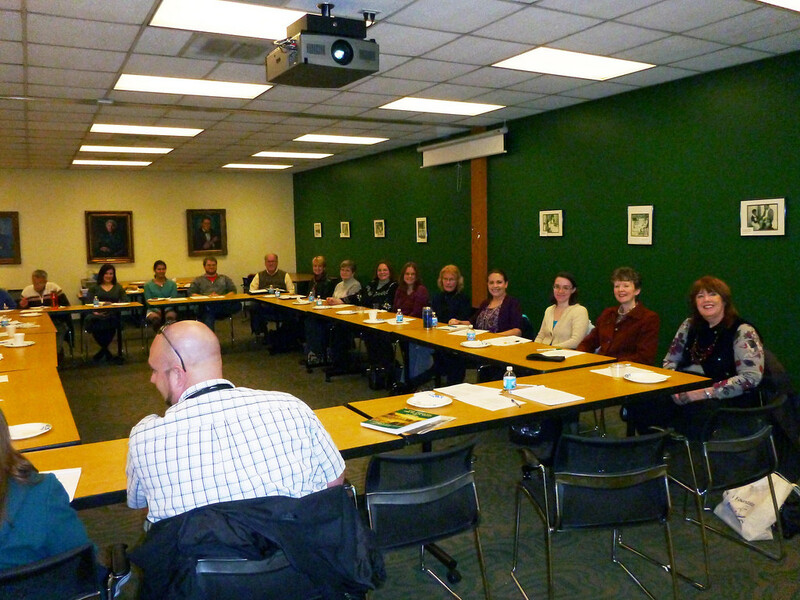 Last Thursday (November 15) was the most recent meeting of the Miami Valley Archivists Roundtable (or, MVAR), an informal gathering of archivists in and around Dayton, Ohio. This time, we met at Wright State University Special Collections & Archives. 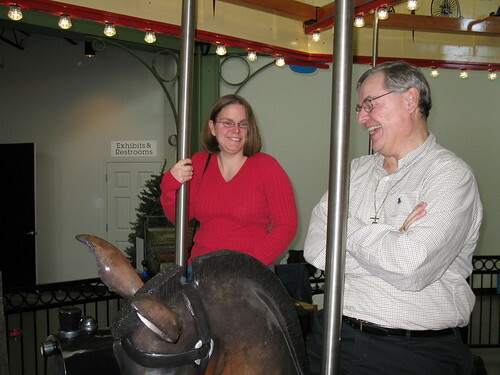 Our hosts were Dawne Dewey, Head of the Special Collections & Archives, and Bill McIntire, Dayton Daily News archivist. 1) I would like to re-instate the keeping of a (for lack of a better term) “membership list”. Since MVAR is very informal and there are no dues, the only real criterion for “membership” is that the person have some interest in “Miami Valley Archives” (as it is the Miami Valley Archives Roundtable). I had noticed from the MVAR Archives (which I didn’t even know existed – although it should have been obvious, seeing as it’s a group of archivists! – until Rachel brought it to me in August) that we used to have an actual member list of names and contact information. I think this would be a good record of growth and changes in the group, more than anything else. 2) I would also like to create a web presence for the MVAR. I had thought for a while that this might be a good idea, but the point really hit home when I saw that on the SAA’s list of archival organizations the entry for MVAR has a link to my blog as the web site. And it was like that even before I became chair or updated the chair’s contact info with them; they did it on their own, apparently because it was the only reference to MVAR that they could find on the web. I think it would be good if we changed that. It could be as simple as a list of the meetings and locations on a free WordPress site. Both of these suggestions were met with generally positive comments. Someone expressed concern that if we had a web site (or a Facebook group) that the announcements on the email list might dwindle. I assured them that I wanted the web site to be in addition to, not instead of, what we do now. After the meeting, I created a brief survey to gauge interest in a membership list and a web site from the whole of MVAR (since not everyone comes to every meeting) and sent out by email. As of this writing, 25 people have responded, and 100% of respondents agreed that a membership list is a good idea and 100% also agreed that a web presence is a good idea. I have not yet acted on either yet, though. I made one other announcement that I thought would be of interest to MVAR members (although many are already aware, I’m sure): to remind them of the upcoming 1913 Flood centennial (in March) and to mention the official 1913 Flood Facebook page, Twitter feed (@1913flood), and web site (http://www.1913flood.com/ – forthcoming). Our next MVAR meeting is not until February, and that seemed too late to be spreading the word! After these announcements (and photos), we did our institutional reports. Judy Deeter of the Troy Historical Society passed around a copy of the recently published Arcadia book Troy and the Great Flood of 1913 (on sale Dec. 3), which she helped write, as well as a copy of Scott Trostel’s new book And Through the Black Night of Terror (about the 1913 flood in the northern Miami Valley). Dawne Dewey of the Wright State University Special Collections & Archives announced that the Public History Graduate Symposium will be held on March 22, 2013, with the Smithsonian’s Tom Crouch as plenary speaker. (This will be the second PH Symposium, and I am looking forward to it. 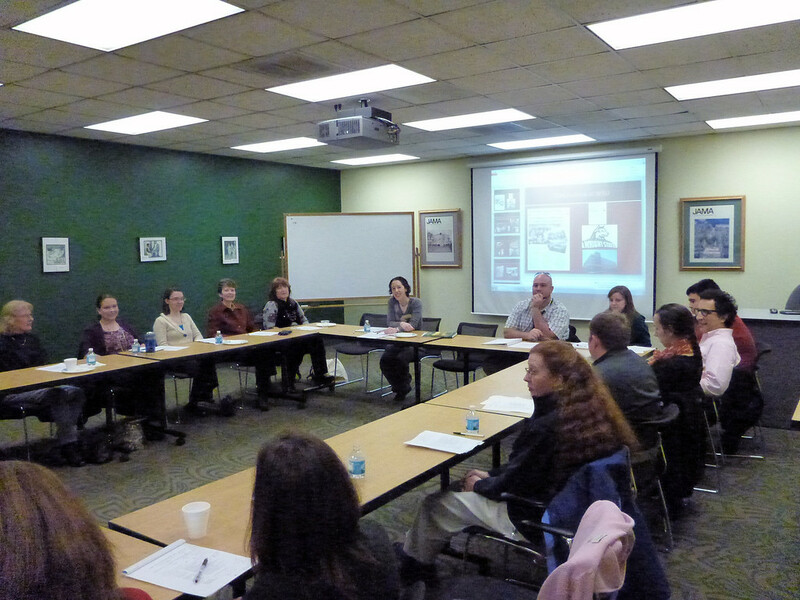 I really enjoyed the 2012 WSU Public History Symposium!) Dawne also mentioned that one of her grad assistants is compiling a list of local resources on the 1913 Flood, so let her know if you have any 1913 Flood collections! Toni Vanden Bos & Gino Pasi, both also of WSU SC&A, announced that the 1913 Flood traveling exhibit that they created will soon be available for institutions to borrow — so watch the SC&A web site for info! 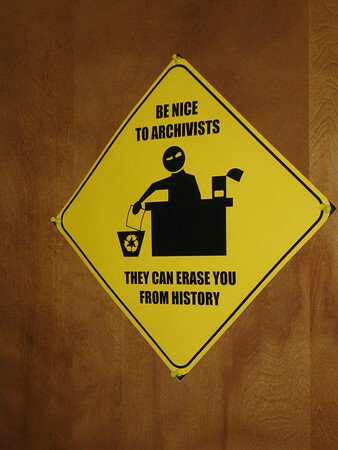 When it was my turn to report (as a new archivist at the Wright State University Special Collections & Archives), I simply stated that I am still in the “getting the lay of the land” phase of my position, since it was only my second week, so I did not have anything terribly exciting to report just yet! Historically, I have not liked to post the info about where an upcoming meeting is going to be held. What if we have pranksters? Or crashers? Or bombers? I brought this up when discussing the potential web site, and people didn’t seem too concerned about it. Actually, it sounded like “trying to find out where the next meeting is” was (in most cases) the primary purpose for Googling “Miami Valley Archives Roundtable” in the first place. So…I guess I won’t worry about it anymore! 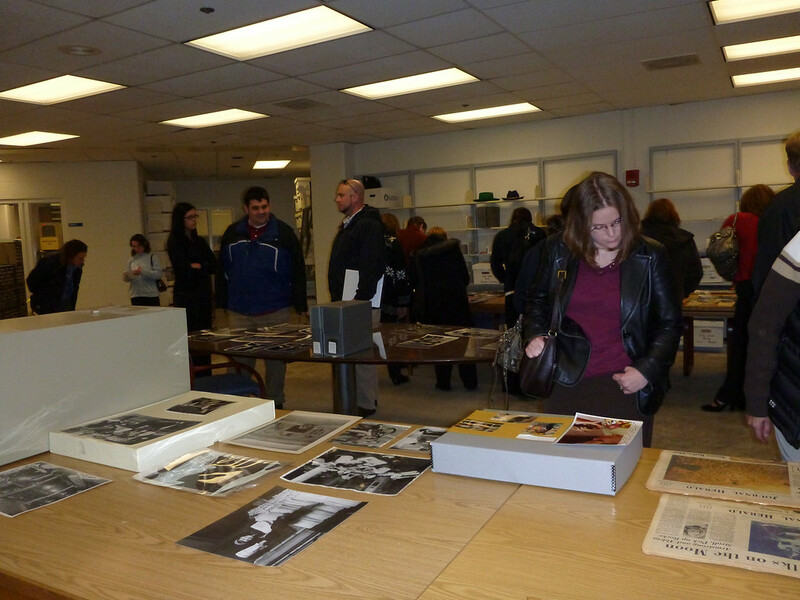 Next, we had a presentation and tour of the new Dayton Daily News Archive at WSU. After the tour, several of us headed out to the lunch portion of the meeting, which was held at the Great American Grill in the new Hilton Garden Inn on Pentagon Boulevard. Another successful (and fun) MVAR meeting on the books! Today was the most recent meeting of the Miami Valley Archivists Roundtable (or, MVAR), an informal gathering of archivists in and around Dayton, Ohio. This time, we met at the Marianist Archives (archives for the religious order Society of Mary). Our hosts were Brother John Habjan, S.M., Jennifer Gerth, and Kim Neuenschwander, archivists. 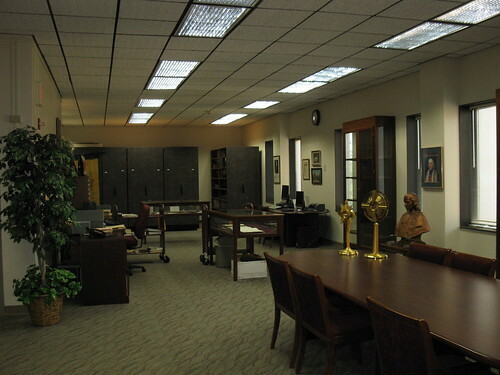 The Marianist Archives is physically located in the Roesch Library at University of Dayton (Dayton, Ohio), which is a Marianist university, but the Marianist Archives itself is not actually a part of the university. (It’s kind of like how Vatican City is surrounded by Rome but has its own government.) They also like people to understand that they are also separate from the Marianist Library and the University of Dayton Archives (although I can understand how it might be confusing!). Rachel Bilokonsky, MVAR Chair, started off the meeting by announcing that this was her last meeting as MVAR Chair. She is passing on the proverbial torch to…me, actually. Effective now—or whenever I get the email list and the MVAR archives files from her, for sure!—I am the new chair of the Miami Valley Archives Roundtable. After that announcement, we did the institutional reports. Rachel Bilokonsky, the MVAR chairwoman and University of Dayton archivist, shared that the University Archives is still tweaking their recent implementation of the Archivists’ Toolkit. She also mentioned that they recently finished up re-housing the 500+ boxes of the papers of former Dayton area Congressman Charles W. Whalen, Jr. , using money from an OHRAB grant they recently received. Gillian Hill and Joan Donovan of the Greene County Archives & Records Center have been spending a lot of time lately updating their database with the new locations of items, since their move to a new facility (see MVAR 5/17/2012). Jennifer Gerth and Kim Neuenschwander of the Marianist Archives shared an article from the Summer 2012 issue of University of Dayton Magazine (pg. 61 print, pg. 32 in the PDF) about the Bellinghausen glass plate negatives collection, which includes lots (about 1,200!) of cool 19th century images of Hawaii, where Bro. Bellinghausen was assigned at the time. Jennifer also shared about a recent history-themed vacation she took, which included stops at Kitty Hawk, NC (Wright Brothers’ flight); Raleigh, NC (lost colony of Roanoke); and Colonial Wiliamsburg. Bro. John Habjan, S.M., of the Marianist Archives, shared about the progress he has made in weeding out multiple duplicates of publications and other items, which has helped create a little more space in the archives. He has also had some luck recently in identifying formerly unidentified group photos, by sending a photocopy of the image to someone he is able to recognize in the photo, and that person can often identify the event and (at least some of) the other people. Natalie Fritz of the Clark County Historical Society has been processing the collection of a previous Springfield mayor. She also announced that the museum will be creating a companion exhibit to go with a theater production surrounding Newsweek’s 50th anniversary article “The American Dream” (1983), which featured Springfield. 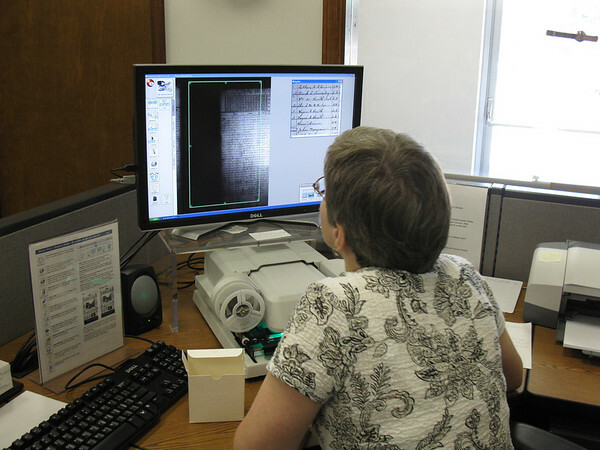 They are also still working on processing probate records through the funding from a recent OHRAB grant. Another one of the Historical Society’s employees, Mel Glover, talked about how they’ve been revamping their collection policy. Shari Christie of Air Force Research Laboratory History Office (at Wright-Patterson Air Force Base) said they have been receiving a lot of new records from the Aeronautical Systems Center, since it is being reorganized. Sr. Noreen Jutte of the Sisters of the Precious Blood talked about the progress of their renovations. Judy Deeter of the Troy Historical Society talked about working with the 1913 Flood Commemoration Committee. They are also producing an Arcadia book about Troy during the 1913 Flood, as well as working on another book for the Troy bicentennial, which is in 2014. Jillian Slater of the Marianist Archives talked about working with their CONTENTdm digital collections, as well as mentioning that they’ve had lots of reference questions recently thanks to the International Marion Research Institute. Colleen Mahoney, the archivist for the Catholic Special Collections at University of Dayton, recently attended the Oral History Institute held at Kenyon College and sponsored by the Ohio Humanities Council. She highly recommends it. Mary Milburn of the Franciscan Sisters of the Poor talked about how they have been working to organize a lot of materials from their attic, as well as visiting sites that were formerly hospitals affiliated with their order. 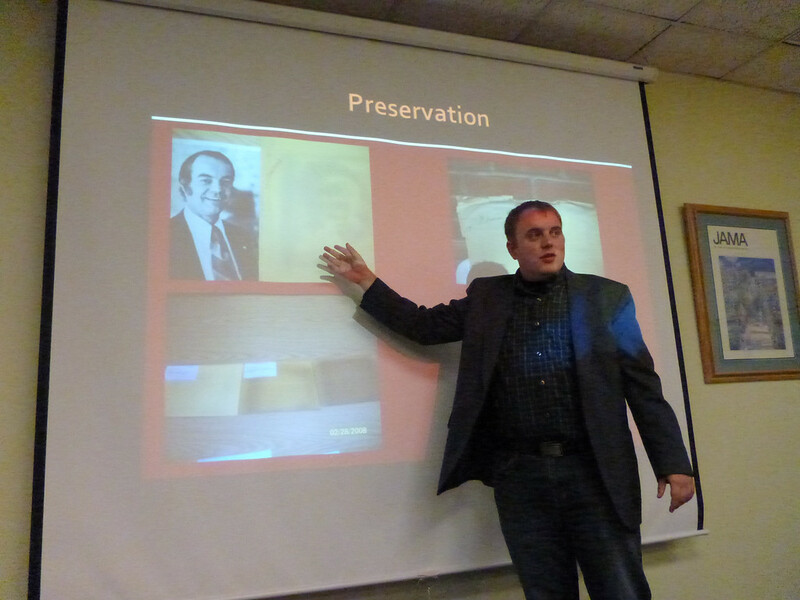 When it was my turn to report (as archivist at the Dayton Metro Library), I shared that I was glad that I could talk about something other than the Forrer-Peirce-Wood Collection in regards to my manuscript processing activities. I have processed several small collections since finishing the FPW (one of our largest) this spring. I mentioned writing on the blog here, working on posting the Bio Sketches to the blog (as I’m sure you’ve seen if you’re reading this! ), and how I’ve been answering “ex post facto” reference questions. I also noted that I’ve received several reference questions through people finding this blog. It seems like there have been a lot more in recent weeks, maybe because of all the Bio Sketches I’ve posted. In response to Jennifer’s story about her history vacation (I spoke just after she did), I mentioned that I recently visited Greenfield Village for the first time, after taking the Certified Archivist exam in Detroit last week. I enjoyed Greenfield Village, especially seeing the Wright Family Home and the Wright interpreters (although I wish they had made the guy playing Orville wear a stick-on mustache, at least, if he wasn’t going to grow one (see photo) — that’s how most people tell them apart, if they can at all! lol). Also, this round it is not really a problem (since only one of those dates has been claimed), but I don’t like to announce publicly where the meetings are. What if we have crashers? Or like that thing where at least one person is always absent from the State of the Union Address, in case someone bombs it? 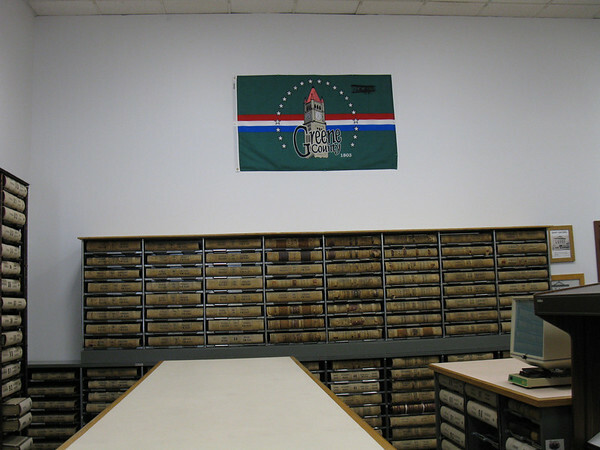 (You never know, somebody might have it in for all the archivists of the Miami Valley. Hey, it come happen. We are rock stars!) But the point is: if you don’t know where the next meeting is, contact me, and I’ll be happy to tell you — as long as you seem, you know, legit. Next was the tour. I had never been to the Marianist Archives before, so I was really interested to see it. I particularly liked all the exhibits they had around the room. One featured a time capsule cornerstone from 1914. That was pretty cool. I meant to take some pictures before I left, but in the bustle of knowing I needed to get back to work, I forgot. But there are some pictures on the Jimmie’s Ladder 11 web site, so you should check that out. Their menu is also on there. I had never been there before, but today I had the “Italiano” sandwich, and I can tell you that it was quite tasty. Everyone else’s food looked yummy, too. Today was the most recent meeting of the Miami Valley Archivists Roundtable (or, MVAR), an informal gathering of archivists in and around Dayton, Ohio. This time, we met at the Greene County Records Center & Archives in Xenia, Ohio, with Gillian Marsham Hill, the records and information manager/ archivist, as our hostess. Gillian and her assistant, Joan Donovan, were eager to tell us all the details of their recent move from their previous building on Main Street to their current location on Ledbetter Road (near several other county offices). But first, the institutional reports! Rachel Bilokonsky, the MVAR chairwoman and University of Dayton archivist, shared that the University Archives has recently implemented the Archivists’ Toolkit as well as a new records classification scheme (with help of intern and WSU PH grad student Maggie Zakri). She also told us about a University Archives open house coming up on June 9 (from 10-12 a.m.), in conjunction with a memorial tree dedication for former Dayton area Congressman Charles W. Whalen, Jr. Whalen was a UD grad (class of 1942), and the UD Archives has his congressional papers, which, incidentally, Rachel told us they recently received an OHRAB grant to rehouse — over 500 boxes. More information about the June 9th Whalen memorial activities can be found on the UD Events page for 6/9/2012. Rachel also asked if anyone else would like to take over as chair of MVAR in the near future, to let her know; she has been chairperson for a few years now. James Zimmerlin of the Records Center & Archives of Warren County said he has his first archives volunteer starting next week, and he will also be hiring a summer intern soon ($8 per hour, 20 hours/week for 12 weeks). 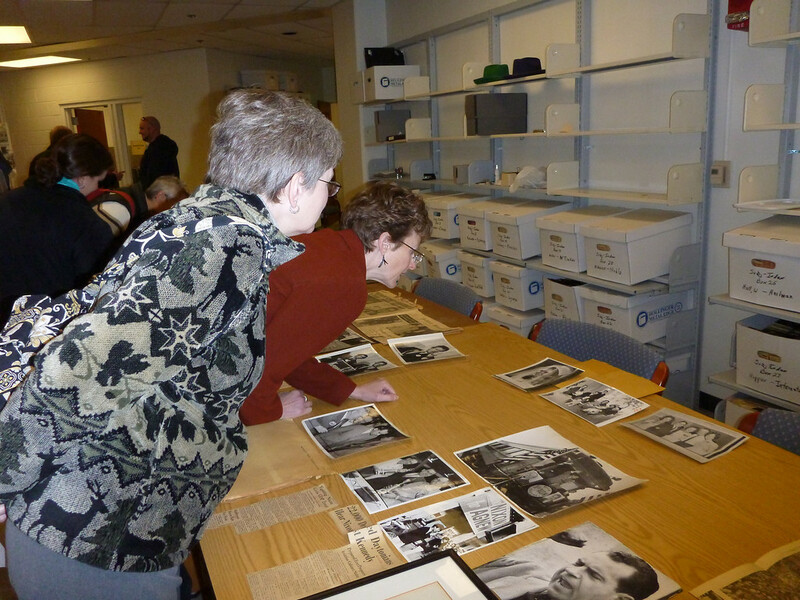 Three archivists from Wright State University Special Collections & Archives were in attendance. Lynda Kachurek is now the Digital Initiatives Coordinator at WSU SCA, which has increased her focus on metadata, web coding, digitization (such as with the Campus Online Repository or CORE), and social media elements of archives. Lynda was also pleased to announce that all of SCA’s 700+ collections now have at least minimal descriptions on th web site. 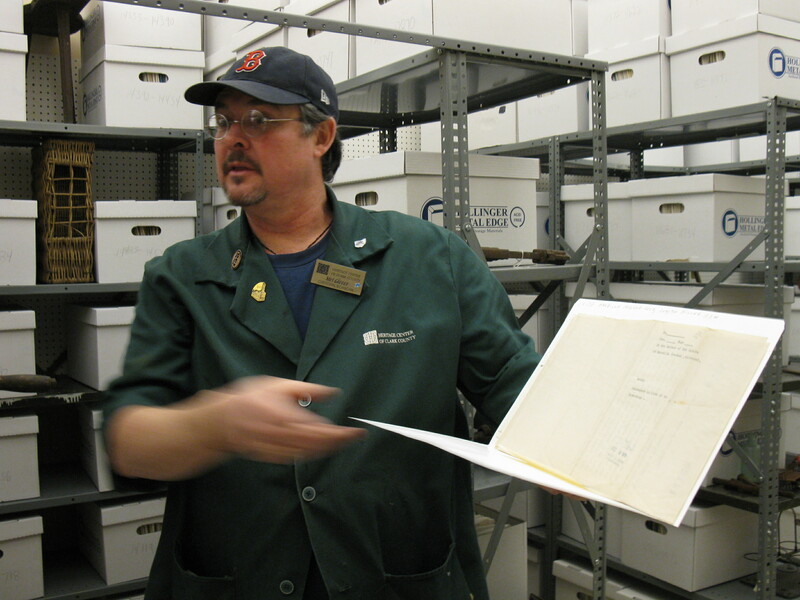 Chris Wydman, Wright State’s University Archivist, is working on a new electronic records policy for WSU, as well as an oral history project with university retirees, which will have video and audio available on CORE. Gino Pasi recently acquired new duties at WSU SCA in the area of collections management. Also, he and fellow archivist Toni Vanden Bos recently applied for — and received — a grant to create a traveling exhibit about Dayton’s 1913 Flood, which they are now creating. Lonna McKinley of the National Museum of the United States Air Force asked if there were any archives topics that people would be interested in hearing a presentation about, as the Midwest Archives Conference is trying to find speakers on various topics. Another one of the Historical Society’s employees, Mel Glover, comically described his duties as often falling under the category of “other duties as assigned.” But he added that it’s a great museum at which to work, small enough that he gets to do neat things all the time, but big enough to have some really cool collections. (I tried to get his words down verbatim, but I’m afraid I failed, so the previous statement lives somewhere in the world between direct quote and paraphrase!) I just thought that was a nice way of looking at things at a smaller institution — not that you “have to” have a hand in everything, but you get to have a hand in everything! Several Wright State University Public History grad students reported on their recent activities, including Noel Rihm, who has been working (along with 4 other students) on an exhibit about Wilbur Wright at Carillon Park (but produced by Wright State U.). The “Wilbur Wright: A Life of Consequence” exhibit will be open to park visitors on May 27. 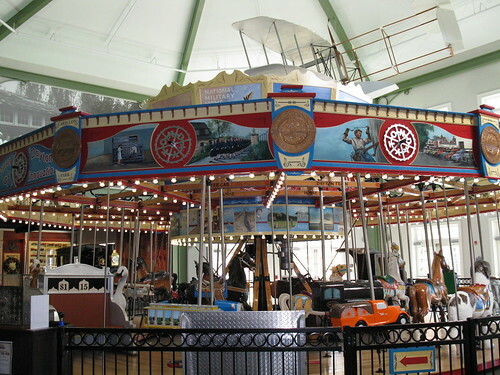 May 30th, 2012, marks the 100th anniversary of Wilbur Wright’s death from typhoid fever, so activities have been planned in Dayton this year to remember him. (Here’s an online list of some of the Wilbur Wright events in 2012.) As a matter of fact, we have a case exhibit about Wilbur Wright currently on display in the Local History Room at the Dayton Metro Library. So come on down to the basement of Main and see it, any time during normal open hours! 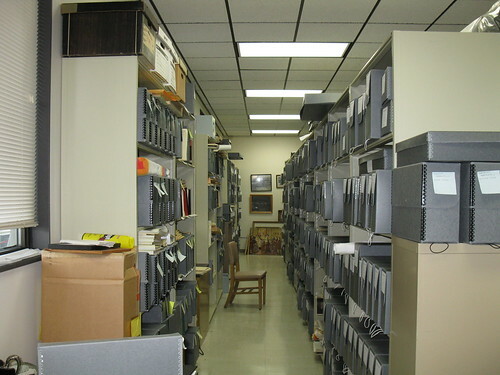 Next, Gillian Hill told us the back story of this past “year of turmoil” and the events that ultimately resulted in moving the GC Records Center & Archives from its previous location on Main Street to the current location on Ledbetter Road. To make a long story short, the previous building, which was built in the early 1800s and included a lot of sandstone, was deteriorating. Although the sandstone deterioration had probably been happening for a while, it did not became obvious until about last May — and at that time it became very obvious and pretty serious, very quickly. But that’s in the past now! And the records survived! (And so did the staff!) And the building was stabilized enough that they could be safely removed, without endangering the humanmovers. So steps were set in motion to move the shelving and the materials to the new location, which has now all been completed, and GC RC&A is back in business! We got a tour of the new GC RC&A location. 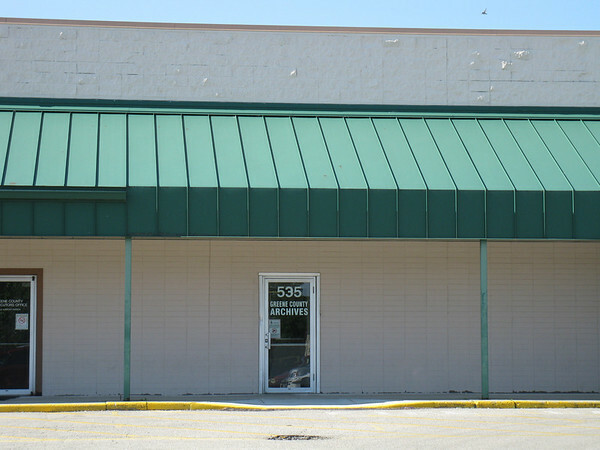 It looked like a nice space and a good size – 4,000 square feet. After lunch, I got a demonstration of the archives’ relatively new ScanPro 1000 microfilm scanner…and, WOW. That thing is amazing. All in all, another great MVAR meeting! Yesterday was the most recent meeting of the Miami Valley Archivists Roundtable, an informal gathering of archivists in and around Dayton, Ohio. We met at the Airstream, Inc., corporate archives in Jackson Center, Ohio, with archivist Matthew Peek as our host. 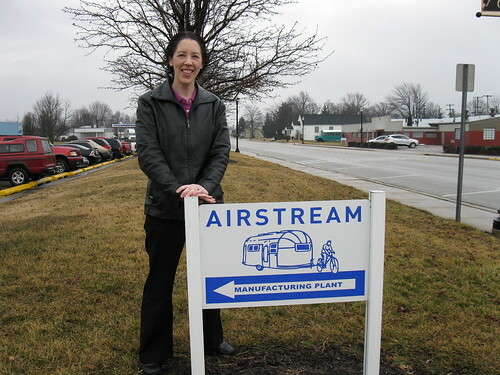 Over the past few months, Matthew, with the help of archives assistant Andrea Green Burton, has been working diligently to develop the Airstream corporate archives from scratch. In other Wright State news, two very interesting collections are nearly completed in their processing and almost ready for researchers: the Dayton Engineers’ Club Records (MS-420) and the Kettering Family Papers (MS-363). Both of those sound like they will be really great resources! Wright State Libraries also has several programs this month celebrating the life of African American poet, native Daytonian, and the library’s namesake: Paul Laurence Dunbar. Check out the Dunbar events and the recently redesigned Dunbar web site. Many Miami Valley archives are kicking into high gear for the forthcoming centennial of the 1913 Flood, Dayton’s worst natural disaster. Some of the folks at WSU are working on creating a traveling exhibit, if their funding comes through. 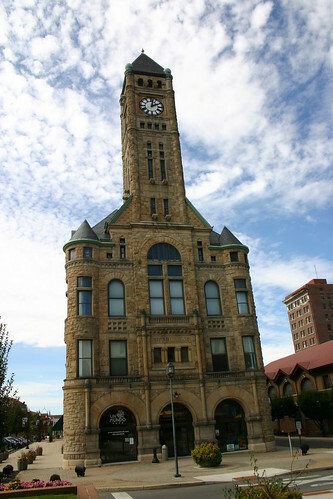 And, in connection with the area’s 1913 Flood centennial steering committee, WSU grad students will be working on creating a web resource that will be a one-stop shop pathfinder to 1913 Flood resources in the Miami Valley. Judy Deeter of the Troy Historical Society discussed a reformatting project for some oral histories with 1913 flood survivors, as well as a forthcoming project from Scott Trostel that will cover a previously little-discussed area of the flood’s history. Judy also shared that the historical society is working on a new Troy history book in honor of the city’s forthcoming bicentennial in 2014. 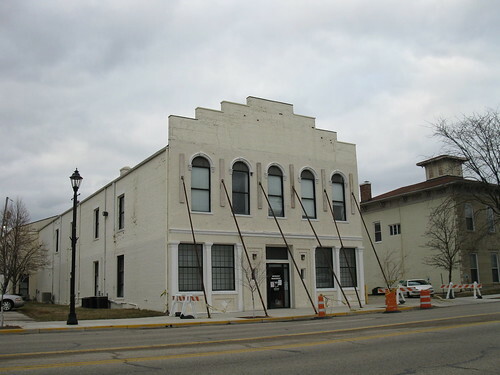 Gillian Hill of the Greene County Archives shared that they have moved from their old building on Main Street in Xenia to a newer one on Ledbetter Road, and that they should be all settled in soon. Betsy Wilson, who writes house histories, shared that she will be giving a program at the Dayton Metro Library about how to research your house. If you are interested in this subject, I definitely recommend it. Betsy really knows her stuff! The presentations will be given: Tues., March 27th, 6:30 p.m., at Dayton View branch; Thurs., April 19th, 6:30 p.m., at New Lebanon branch; and Mon., April 30, 2:00 p.m., at East branch. Galen Wilson of NARA discussed this year’s OHRAB archives grant opportunity, saying he wanted to point out that this year the grants are open to any records significant to Ohio history, not just government records. Grant proposals are due Feb. 28th (more info). Natalie Fritz of the Clark County Historical Society discussed a probate records processing project they’ve been working on which was, incidentally, funded by one of last year’s OHRAB grants. (You can read about their project in their reports at the OHRAB web site, under the list of 2011 Awardees.) Natalie also mentioned that the Historical Society will soon be receiving 1,800 original ledgers of historical Springfield school records. That is very exciting and will be really interesting and useful for researchers! For my own report, I shared that I am (still) working on the Forrer-Peirce-Wood Collection (MS-018) at the Dayton Metro Library, which, if you’ve been reading the blog regularly, you probably knew, since I am always talking about it! The collection includes materials from several generations of the family of Miami-Erie Canal engineer Samuel Forrer. It is about 20 linear feet and is mostly correspondence between the several family members. Since there is so much “stuff” for each of about 10 people, I am currently in the process of writing detailed biographical sketches of each individual. During the institutional reports, someone passed around a copy of the Dayton Daily News article “City set to Receive National VA Archive” (Feb. 2, 2012). Apparently, there is a very good chance that the national archive for the Veterans Administration may come to Dayton’s VA Center (formerly the National Soldiers’ Home – see pics from DML’s collection). According to a quote from Senator Sherrod Brown, from the article, “the archive itself would likely employ about 25 people.” So that could mean exciting news for recent and upcoming WSU public history grads who wish to remain in the Dayton area. Next, we received a tour of the Airstream corporate archives, which was recently organized by archivist Matthew Peek. 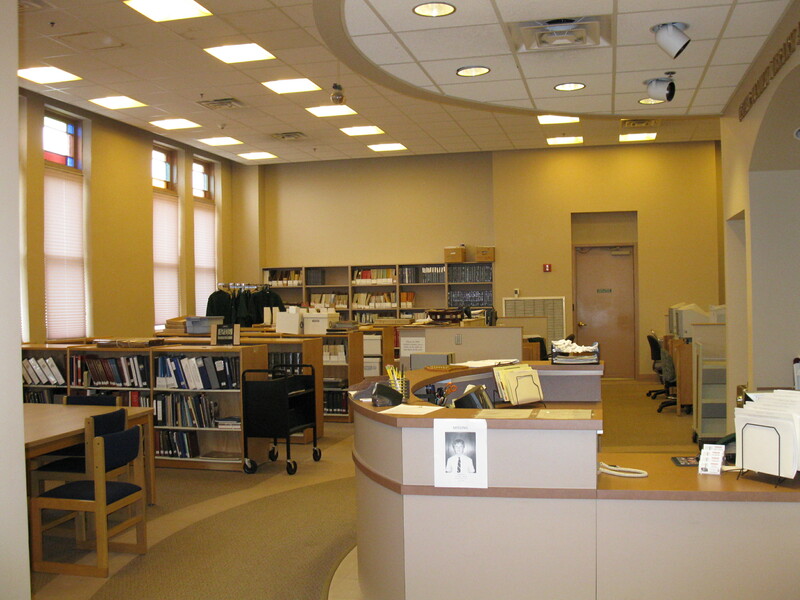 Matthew showed us the several rooms of the archives, including about 60 linear feet of shelving with boxed materials, file cabinets of subject files, map cases for engineering drawings, and a film room with several reels, negatives, and VHS tapes. As the task of creating this archive was only just undertaken a few months ago, the degree of physical and intellectual control of the materials seemed impressive to me. After the tour, Galen Wilson gave a short presentation, a PechaKucha talk about errors throughout history, which was very entertaining. Then, our host Matthew showed us a 20-minute film “Trailers Away with Caravan America,” which was recently digitized from a 1970s original. We enjoyed a lunch of Subway sandwiches, and more great networking and conversation. I just love these MVAR meetings, because whether you work in a large archives or are a “lone arranger” (or somewhere in between, as most of us are), it’s nice to know that you are never really alone. This morning was the most recent meeting of the Miami Valley Archivists Roundtable, an informal gathering of archivists in and around Dayton, Ohio. 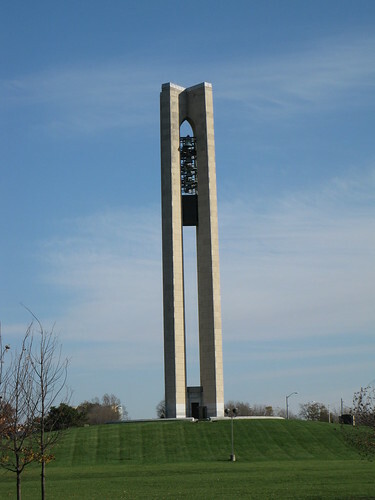 Today, we met at Carillon Park. Perhaps the most important (or at least universally of interest) snippet that was mentioned today is that the Miami Conservancy District is heading up collaborations in relation to the centennial anniversary of the 1913 flood, which devastated Dayton (and many other cities in Ohio and other states). I believe there is a sort of listserv or other type of information “network” in the works so that we cultural institutions in the area can stay apprised of what one another is working on relative to the flood centennial. I believe one of my co-workers attended a meeting about this yesterday, and I intend to stay informed of these activities as well. I for one am hoping that there will be some kind of public web site put together so that we can all share info about our events and exhibits there, so the public can get all that info in one handy place. A representative from the Middletown (Ohio) Historical Society shared exciting news that they have recently received a large collection from the Middletown Journal newspaper: files and clippings collected by the newspaper over the years. (If I understand her description of the collection correctly, it sounds very similar to the Dayton Daily News Archive acquired by Wright State University Special Collections & Archives, or the Xenia Gazette newspaper morgue recently acquired by the Greene County Room a few years ago). That is very exciting for Middletown’s history! The collection also included a large number of Middletown city directories – which, as I wrote about previously [10/25/2011] – can be very helpful for local history research! Noel Rihm, a grad student in Wright State’s Public History program, announced that an exhibit she designed – “Longtown” (read announcement) – will be opening at the Garst Museum in Greenville this Sunday, Nov. 20th. Yay, WSU PH grad students! Speaking of Public History grad students, Dawne Dewey, directory of the Wright State public history program, announced that a Public History Graduate Student Symposium will be held on March 2, 2012, in the WSU Student Union. PH students will give presentations about some of their projects, and the event is free and open to the public. She also noted that she’ll be needing some local PH professionals to help moderate the panels, so let her know if you’re interested! Gwen Haney from Dayton History shared that they recently (in September) finished the digitizing and sharing online of 20,000+ images from the NCR Archive. They are now working on 5,000+ glass plate negatives from the Kern Collection, about 2,000 of which depict Dayton from ca. 1890-1900. James Zimmerlin, archivist/records manager at the Warren County Records Center & Archives, mentioned that he will be hiring in the near future for a part-time position (about 10 hours per week) to help out with answering public records requests. So if you are interested in an archives/records management-related PT position in the Lebanon area, be on the lookout for this job posting! Someone mentioned that they were able to find 19th century Cincinnati birth records submitted by the University of Cincinnati to the OhioLINK Digital Resource Commons (DRC) (which unfortunately seems to be down at the moment, as I try to link to it). Here is a link to what I believe is probably the same material, but from a landing page on UC’s site. I am always a fan of new sources of FREE history and genealogy records. I will finish up by sharing a dash of humor from the reports. One archivist reported learning recently of a police department (which shall remain nameless: the archivist did not even tell us which one, so I couldn’t tell you even if I wanted to!) that has been filing their records phonetically. That is, files about individuals are organized phonetically by last name. For example, if they had a file for the actor Matt Czuchry, it would be filed under “Z” not “C” because the name is pronounced “zoo-crie”. Suffice it to say, we all found this very…unusual, to say the least. Our agenda also includes the dates and locations of future MVAR meetings. The next MVAR will be held on February 16, 2012. However, the location has had to be changed. The National Museum of the United States Air Force was planning to host us in February, but due to circumstances beyond their control, they will no longer be able to do so. Therefore, a new host institution is being sought for the Feb. 16, 2012, date. If your institution would like to host, please contact Rachel Bilokonsky. The dates Aug. 16, 2012, and Nov. 15, 2012, are also still available. May 17, 2012, has already been claimed. After we had finished all the business that we generally do whilst sitting around a table (hence, roundtable! ), Gwen Haney gave us a tour of the newer parts of the Kettering Family Education Center at Carillon Park. The tour included the original Deeds Barn, which was moved from the Kettering-Moraine Museum in 2009 and is housed inside the Kettering Center so it will no longer suffer the effects of Dayton’s weather! …where as a special treat, we got to take a ride! And then we enjoyed an approximately 20-minute presentation in the new 4-D theater, where [animatronic versions of] John H. Patterson, Wilbur and Orville Wright, Charles F. Kettering, and Edward Deeds talked to us about Dayton’s history. The theater presentation also included some film clips and the occasional rumbling of our seats or spritzing us with water, as appropriate! It was definitely neat! After the tour, we enjoyed lunch and continued our informal networking. I really do love these meetings. It’s such a great way to keep up to speed on what other archives and museums in the area are up to! Just a friendly reminder that tomorrow – Thursday, November 17th – is the next gathering of the Miami Valley Archives Roundtable. The meeting begins at 10:00. If you need the details, feel free to contact me.